Send a greeting card to your Nanna on her birthday. 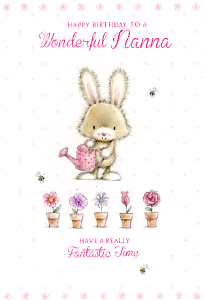 This cute,summery card is a lovely way to wish your Nanna Happy Birthday. 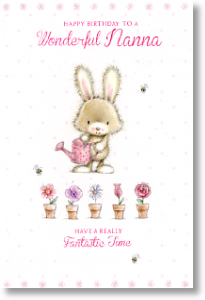 Illustrated with a fluffy-bunny and flowers the front of the card is embossed and extra sparkle is added with glitter detail.